Today I returned to check on the adult male that I released several weeks ago. If you read the earlier post about him you know that the family dynamics were not exactly what I expected upon his return to his family after a month in rehab. The female treated him like an intruder and would not let him near the nest. I have returned to visit several times and found him sitting near the nest once, with all his chicks on the nest with full crops. I did not see him feed them tho and the female still chased him off. On another visit he could not be found anywhere. The volunteer monitor has not seen him either. The female seemed to be caring for the chicks alone. When I arrived today I found one chick on the nest and another one arrived a short time later and perched nearby. Much to my surprise, the male came flying in with a fish and gave it to the chick on the nest! She grabbed his foot in the process of diving for the fish, but she finally let go and he zoomed off. He returned shortly and perched nearby as one chick ate and the other begged for food. I enjoyed watching him closely as he watched over his territory. Then some chaos errupted with another osprey flying around, which was the third chick and then the female arrived on the nest with a fish for the chick who missed the males delivery. Suddenly there were three Ospreys flying around and I was not certain who was chasing who! And as quickly as that brouhaha exploded, it ended and the flying Ospreys disappeared, leaving two chicks, each eating their own fish. I stayed for four hours just watching every behavior. I hoped the male would return, but he didn't. The female was there standing guard for part of that time, so I have not seen him feed the chicks when she is present. But one big question has been answered. The month long absence while he was in rehab, did not turn off his parental instincts. He still clearly feels that this is his territory, and these chicks are his to care for. I am still so curious about these birds and I continue to learn something every day I spend in the field. At one point today there was one chick on the nest, seemingly positioning herself for the next fish delivery. The other chick was perched nearby in a tree, also waiting for food. The chick on the nest saw another osprey, not one of the family, and gave a little alarm call and flew up to circle around and the chick in the tree seemed to see this as an opportunity to sneak in and take over the nest, so she zoomed over to land on the nest immediately while the other chick flew a brief loop around the nest. The first chick had lost her position on the nest, and that started a little squabble. She landed on the other chick and they both fell off the nest, but the original nest sitter was the one to get back on the nest first! It was like a little game of musical nests! So interesting to watch what seemed to be tactical maneuvers by the chicks to get the prime spot on the nest, to be positioned to get the next fish. I watched the jockeying for position, back and forth. This is probably a response to not getting enough food, so the competition for fish becomes exaggerated. There is always something interesting to watch! Even just noticing that when the female was there standing guard, the chicks finally felt free to snooze a bit, knowing that she would alert them to any danger. I am never bored watching these guys, always learning something. So that is the update on the family of the rehabbed male. All Ospreys are well, and the male continues to try to inhabit his territory and care for his offspring. It will be interesting to see if the female will leave soon, allowing him to take over complete care of the chicks, or if she will fight to the end of the breeding season. Both adults are displaying strong urges to care for these young Ospreys under an unusual circumstance. An update on the young osprey I released last week...after her harrowing day of absence (harrowing for ME!) and her happy return to her nest, she has stayed put. I have visited her many times and she has remained at home this last week. I only found her perched on a nearby cell tower once, otherwise she stays right in the nest. She missed ten days of her normal development while in rehab and seems a bit traumatized by her experience, so she is staying safe. It's all good for now, but eventually she will have to venture forth. One other chick has been there with her much of the time, tho yesterday she was alone in the afternoon. The third chick, a male, has not been seen in about 6 days now, and neither has Mom. She is eating well and clearly putting on weight in preparation for what's to come. But she needs to develop her flight skills and start thinking about how to catch a fish. I will keep watching...I think many rehabbed birds are not followed closely to see how that experience affects their development. It's especially tough for a young bird, whose normal development is a little altered by the time in a cage. We were lucky that this osprey could be returned to her nest while the parents and siblings were still there, as this will support her reintegration into osprey life. What a spectacular day it was here in Minnesota...upper 60's, sunny, breezy, low humidity, popcorn clouds. Perfect! What a pleasure to be out there checkin on some nests I had not been to in a while. On many nests I found no females and males were scarce also. I was surprised at how many chicks I did see, tho some were missing, some nests empty. I spent quite a bit of time at a nest that had only one chick, but she is a beauty! Somehow she was captivating to me today. She was flying loops, dipsy doodle, landing in trees, returning to the nest to food beg. Her crop was very full, displaying her large dark spots symmetrically spaced across her breast, but I did not see her Dad feed her. Another male tried to land several times, hovering above the nest, but each time she acted defensively and he finally flew off. Then another male, which might have been Dad, became involved with a redtail that was acting very aggressively, divebombing, footing and driving this adult osprey down to the ground. This is fairly uncommon as they usually ignore each other. Eventually they all disappeared, including the young osprey. I also hiked into one of the nests that was completely blown out, killing three chicks, during the big storm on July 18. I was surprised at the amount of damage done in that area. Their favorite big, old perching tree was down. This opens up the area, which may be good. The nestpole itself was twisted and leaning, but the Ospreys are rebuilding the nest. I was able to find both adults, and read the males band. I am relieved to know that they both survived and will be able to try again next year. I was surprised, with so many females gone who still have chicks near their nests, to find this female still here, working on the nest with her mate. Something both sad and touching about that. I also visited one of my favorite nests. They have a devoted Dad and this nest is always successful. I had not seen all three chicks for a while, but today when I arrived, all three were lined up on the nest waiting for Pop to bring dinner. A special treat for me in these waning days of Osprey season. They, also, struck me as really beautiful Ospreys. Maybe it was the lovely light today, the late afternoon, axial rays of golden sun, showing off their increasingly golden eyes. The cooler temps and low dew points made the sun feel good on my face. You really just have to stop and take it all in deeply. What magnificent birds, and how lucky I am to know their stories, their histories, their struggles and their triumphs, year after year. These three juveniles waited so quietly and respectfully...until they saw Dad coming with a fish and the hollering began with gusto! I had to laugh. Who will win? Ah the largest female with the fullest crop dove for the fish and got it. The little male grabbed for it, but only got Dads foot, and wouldn't let go for a minute. Dad waited and then flew off as fast as he could...gotta go get more! The winning chick took the fish and flew off behind some trees to eat in peace. This is exactly why I see so few males these days! I have also been enjoying watching the young ones develop their skills...even just perching near the water and watching the fish below is part of learning how food looks when it is not delivered to them on the nest! So fun to watch them splashing into the water, not to catch a fish but to learn how to dive and how to get those great water starts! So much to learn in such a short time. Their days of playing and depending on Dad for food are coming to an end. How I will miss these friends in a few weeks. It was a day to savor. 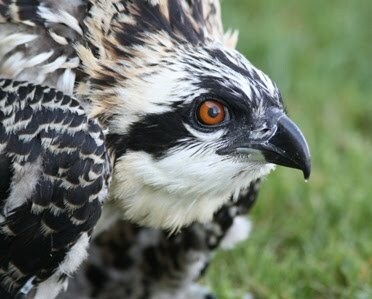 I released a juvenile osprey yesterday after about ten days in rehab. He was found on the ground but actually had no broken bones. Unfortunately, when I opened his box he did not fly immediately, but turned to look at me...so I backed up and he took off in a different direction than I thought he would. He did not head for the nest but veered off, flying very low and dodged some trees and then over a hill and he was gone. Darn it! I spent a long, hot, humid day searching for that chick. I found the other two fledged chicks from his family and learned all their secret perching spots. Every time I saw a juvenile flying I chased after it...is it the released chick? Nope. They came and went, had lunch served, and I located both adults but alas, the missing chick evaded me completely all day. I finally gave up in defeat...tired, hungry, thirsty, and went home. I worried about him all night and was back there by 8 a.m. to start the search all over. As I drove up to the nest, I held my breath....hoping he would be on the nest, but he wasn't. In fact, no one was. Not an osprey in sight. I waited. Eventually the female came with a bright goldfish and she circled all around the area, a typical display meant to attract any hungry chicks in the area. No takers, so she ate it herself. The male arrived and perched right next to her, scanning in all direction for the kids. Eventually they saw a visiting osprey down the road and they both took off to circle with him, eventually disappearing from sight. The temps were climbing rapidly and the dew points were horrendous. After three hours I left, discouraged, and got an iced coffee, but something inside said, go back to the nest...so I did just that. As I drove up, I saw an osprey on the nest....holy smokes, I could not get to the nest fast enough, fumbling with the scope...and then I saw, it was the released chick! Yeah! Finally this guy made it back to his nest, almost exactly 24 hours after I had released him. His crop was very empty. He sat so quietly. No adults anywhere in the area. Suddenly he started food begging quietly as an adult male osprey flew in circles above the nest. He did not land but perched on another structure nearby where I could read his band...not Dad, but a male that I have now seen at seven different nests this summer! He is a story for another day...seen all over the metro area after being displaced at his nest. He cracks me up. He eventually flew off. We waited. I finally was so wilted from the heat that I had to take a break and seek refuge in a cooler spot. A few hours later I returned to find, another chick on the nest with the released chick, and my little friend finally had a full crop and fish bits on his beak. Happy at last...me, that is. Then Dad came with a fish, and the other chick lunged for it. The released chick did not even try. He was full, in fact the tail of a goldfish was laying on the nest edge. He finally picked that up and was nibbling on that fishtail in 95 degree heat as I finally headed home to relax, worry free. He doesn't seem to want to leave the nest now that he has made it back there. All is well, I saw all members of the family today, and life has returned to normal here. I will still continue to watch over this nest as the season winds down, but I am relieved. Now I can get back to watching the other drama again from the previous post! This is my crazy life. We have had an unusual turn of events on one nest that I have been watching. The adult male was injured in early July and wound up in rehab at The Raptor Center. That left the female caring for three chicks on her own. When he was ready for release, they asked if I would like to return him to his nest. In 22 years of studying these birds, I have never had the opportunity to release an adult osprey back into his territory. We have rescued and returned many juveniles in those years , but not that many adult Ospreys get injured and recover fully during the breeding season so this was something new for me. Another chance to learn! We pondered what might happen after a full month in rehab. Would his parental instincts have turned off? We expected that the female would recognize him, since they had been together for several years and mated pairs seem to know each other upon return each spring. When I released him however, the female went after him like a bat out of hell. Full on alarm calls, way past the usual chirping that is an indication of an intruder. She dive bombed, and chased him relentlessly. I stayed all day to observe and she would not let him anywhere near the nest. The chicks all had empty crops. She finally responded to her chicks cries for food and left for a short time, during which time the male calmly perched near one of his fledged offspring. When she returned with a fish, she chased him off again. The next day a male flew over with a fish and, again, she took off after him. We watched closely for days and did not see the male here. Six days after his release, I arrived to check on the situation (a volunteer monitor had been checking the nest almost daily) and I found all chicks there food begging, one eating a fish and the male calmly perched nearby. Oh happy day! BUT, then the female returned and chased him off again. This is all very interesting to me behaviorally. We have to be careful about anthropomorphizing in a situation like this, and it's easy to slip into that mode for some easy answers. One way I evaluate behaviors is to realize that these birds are largely driven by two motivating factors. One is to survive and the other is to reproduce. Both of these Ospreys had been deeply involved in those struggles. The male struggling to survive in a difficult situation (rehab is not easy for an osprey) and the female struggling to survive herself and to make sure that her offspring survived. Did she not recognize him? Did she determine that this male was unable to provide for her and the chicks, and therefore saw him as a threat? Does the pair bond dissolve under these kinds of stressful circumstances? We know that the delivery of fish is a behavior that strengthens the pair bond, and the lack of provisioning during that month may have damaged their bond. I am still trying to determine if he has some parental urge to feed his young, (I have not seen him deliver a fish to the chicks, but I can't say that hasn't happened). He clearly still views this as his territory and given a chance, he wants to be there. Will they work it out? I have to say that yesterday, for the first time in recent days, all chicks had food in their crops and seemed to be doing well. The female and chicks seemed so stressed right after his return. And I have seen other single females who have been in survival mode become very stressed and very defensive towards all other males. But I have also seen a single female with chicks (whose mate had died) allow another male, unrelated genetically to the chicks, bring fish to her and remain on the nest, tho he would not directly feed those chicks. He only brought fish when the adult female was present, as part of the typical courtship behavior. He also chased away other males which offered some protection to her and the youngsters. He won himself a territory with these behaviors and was the resident male there for many years after that. Those of you who know me, know that I relish an opportunity to learn more about their behaviors and this new situation has been a great chance to understand these birds better. But we have to refrain from making up stories about what is happening, projecting our human emotions and judgements upon them. We will continue to observe as much as possible and keep very careful notes about the behaviors we see. The good news of course is that his injuries are fully healed and he flies beautifully! Thanks to TRC for that! But we also see that just fixing up bodies is not the end of the story. The social struggles in this family of Ospreys continues. Getting that wistful feeling....this past week I am noticing changes on our osprey nests. All season long we have seen the adult female perched on the nest with the chicks or somewhere nearby, but now I am seeing fewer females and suddenly the males have a more prominent presence as they take over the duties of watching over their offspring, providing food when necessary. We are also finding it harder to locate all the chicks as they begin venturing forth on longer adventures in their neighborhoods. It's interesting to see several reports from across the pond of tagged Ospreys who have begun their migration, or chicks that are making trips away from their home territory. It happens so quickly doesn't it...I just read about Beatrice the osprey on Roy Dennis.org....she is a satellite tagged bird who began her migration on August 1! But I still have some evolving stories to share about our Ospreys here in MN...stay tuned. Once again I must apologize for the gap in posts. There has been so much going on that its hard to get around to writing. First of all we are still checking nests for successful fledging and finding more failed nests. In fact, I am finding it troubling that at least nine nests have failed in about a five mile radius in one part of the metro. There is no other concentrated pocket of failures like that in any other area that I am monitoring. One person casually blamed it all on Eagles, but to assign blame like that there must be some evidence to support that assertion and I haven't seen it. I observed one of those nine nests being harassed by Eagles, who were nesting nearby, and as a result the Ospreys eggs did not hatch. They were chased off the nest so often by the Eagles that their eggs may have died, although we don't know if they were fertile or not. I observed no eagle harassment on any of the other nests in that area. One nest clearly failed as a result of Great Horned Owl predation since the adult female was found dead on the ground with her head missing, and all chicks gone. Owls often remove the head of a bird that large since they cannot carry the entire body. There are many other areas in the metro where we see numerous Eagles, and the osprey nests in those area have been successful. So what is going on? I have no answer. I guess sometimes we can only notice the patterns and raise questions. This is something worth paying attention to. Could there be a water quality issue? Could there be a contagious disease like avian flu? This is why we continue to research and monitor the nests of these Ospreys. We have 31 years of data collected and that allows us to examine long term trends in productivity. Ospreys are an indicator species, at the top of the aquatic food chain, so the health of their population reveals much about our environment. This is what keeps me going...the questions. My curiousity has never waned about these birds, and their behaviors. I am working very hard to account for all chicks after fledge and it is not easy. It requires repeated visits sometimes and searching for the young ones. It's so delightful to locate all the chicks in a nesting territory and watch them flying, chasing each other, trying to dive into the water, all the dipsy doodle aerial maneuvers...and then congregating back at the nest and whining desperately for food. They are a noisy bunch! It's also so frustrating to not be able to find them all. Its beginning to look like our overall failure rate may be high this year. This is also the time of year that the fledglings get into trouble and rescues need to be done. We know of several that were rescued, one died and one may soon be returned to its nest. And yet, we are also still seeing new banded birds! We refer to these young unmated birds as "floaters"! It's actually a very interesting and busy time of year! Me and the volunteer monitors are being stretched thin as we try to determine true outcomes on the nests.